I suspect that most people have their own individual methods of making garlic bread, because garlic bread, as Scott Pilgrim astutely pointed out, is the greatest food in the world. There might be people out there who don’t love garlic bread, but I don’t know if I want to know those people, y’know? And no doubt, garlic bread fans all have their go-tos. Cutting the bread longways. Spreading on mayonnaise and parmesan cheese. Cutting to the chase and going straight for the frozen Texas Toast. My own method comes from watching my dad make this (horizontal) version for many, many years. It is heavy on the butter and garlic (only adding to its deliciousness), and a little labor-intensive but I promise you the results are worth it. Every time I make it, I feel like my dad’s own inspiration might have been this 1970s bread commercial. At any rate, slice into a French loaf about a half-inch apart, but be careful not to cut all the way through, leaving the loaf intact on the bottom. Then lightly sauté a lot of garlic in a lot of butter (low heat—garlic and butter burns easily!). Encase the bread in foil, then spoon the garlic butter between each slice. Hey, I didn’t say this was going to be easy, but that’s how the garlic deliciousness gets there. If you have any butter left over at the end, just pour it over the top, just like the Home Pride Butter Top people. In what is definitely a 1970s nod but something that tradition will never let me change, sprinkle liberally with dried parsley flakes. 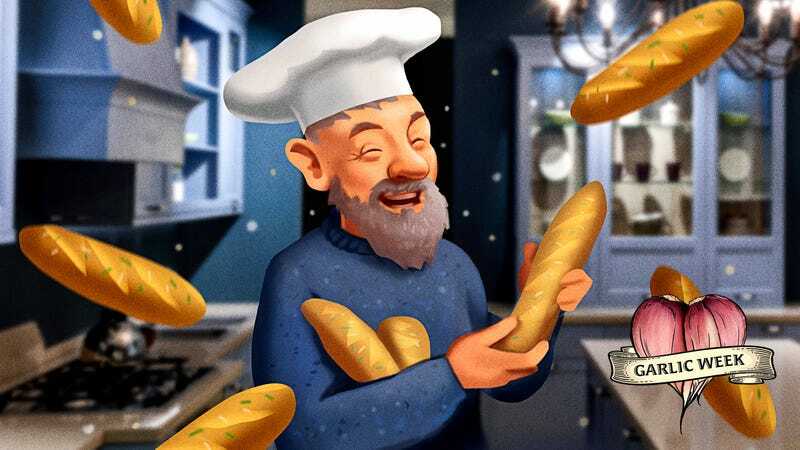 Bake until the bread turns crusty, and let your guests tear off a few slices at a time while they exclaim wonderment at your garlic bread prowess, just like Ramona does to Scott Pilgrim. Lightly sauté garlic in butter. Cut bread into slices, stopping before you reach the bottom of the bread. Then surround the loaf in foil. Using a large tablespoon, spoon the garlic butter between the slices of bread, spreading liberally. If you have any butter left over, pour it over the top, Home Pride Butter Top style. Sprinkle lavishly with dried parsley, close up the foil, and bake at 350 degrees Fahrenheit for 15 to 20 minutes, until the bread is crusty (but not singed). Let bread cool, then tear apart and destroy. What do you eat and drink when you’re sick?